Preheat oven to 350 F. Cube sweet potatoes and boil until you can pierce easily with a fork then drain. Saute onions with olive oil until translucent, then take them off the heat. Mash the sweet potatoes and and mix in the onions, lime juice, black beans and taco seasoning. The creamed spinach- if you have an amazing creamed spinach recipe, or just happen to have some laying around in your fridge, use that. I made a quick concoction out of cooked frozen spinach that I heated up and mixed with cream cheese, garlic and a pinch of salt. In a baking dish, pour half of the bottle of enchilada sauce. Place a tortilla in the dish and coat both sides with enchilada sauce. Fill with the sweet potato mixture, top with the creamed spinach, and roll it up! Repeat until all of the filling is used (makes 5-6 enchiladas depending on how big you decide to make them). Pour the rest of the enchilada sauce on top and spread out evenly. Top with cheddar cheese. Bake for 20-25 minutes until sauce is bubbling. 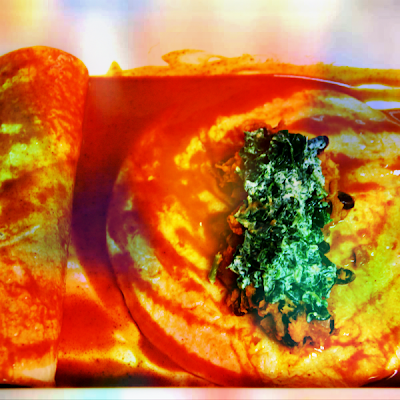 Would canned Saag Paneer work in place of the creamed Spinach? Mmmm...yes of course! That sounds fantastic! I will have to try it next time.